If there’s anything that I have learned from visiting different restaurants, it’s this: never have your mind made up as to whether or not you will like something new. For me, it was hard to put this into practice when I was visiting Tucker’s Onion Burgers. Anyone who knows me pretty well will tell you that I’m not a huge fan of onions, so I was hesitant when visiting Tucker’s Onion Burgers. This was the first restaurant review that I was actually apprehensive about. However, I tried to keep an open mind. It turns out, though, that my worries were unfounded. Picture, if you will, a diner from the 1950s. Checkered floor, old jukebox and classic chairs and booths. Now, take this image and fast-forward about sixty years, but rather than keeping the 50’s style atmosphere, allow everything to change with the times and culture. This is will give a good mental image of what Tucker’s is like on the inside. It feels like what a 50’s diner would be like if it were built in 2014. It’s a welcoming and fun environment with great music as well as great food. The crowd was smaller than I had expected, but I would bet that there are generally a lot of customers. Nathan Schauer and I went on a Sunday evening, so that might explain part of the missing crowd. Still apprehensive, I went in not quite knowing what to expect, but hoping for the best. The menu was fairly simple. It mainly consists of three burgers: a Single Onion Burger, a Double Onion Burger and a triple onion burger known as the Mother Tucker. All of these come with or without cheese, but they are all served with a load of grilled onions. They also offer healthier choices like salad or a turkey burger, but I chose the Double Onion Burger because I only wanted to halfway clog my arteries. Nathan took the healthy route with a turkey burger, which he said was quite good. Personally, even after my fear of the onions, I will say that Tucker’s offers seriously good food. Like I said, never have your mind made up about something before you try it. I was halfway expecting this to be my first negative review, but I was entirely wrong. Both Nathan and I plan on returning to Tucker’s Onion Burgers before the semester is out. As far as pricing goes, Tucker’s is about average. For a combo Double Burger, fries and a drink, you would be looking at around $11 or so. Not bad, considering how much food you get for that price. The burgers are big by themselves, but he fries only come in one size. That size would be best called the “bucket” size. For $2.59 an order, the fries are bountiful. However, my one negative comment would be that the food was a little greasy, which I don’t mind too much because I grew up on southern-style cooking. So, if you’re looking for a good meal at an average price, head over to 324 NW 23rd St. I trust that you will enjoy Tucker’s Onion Burgers. 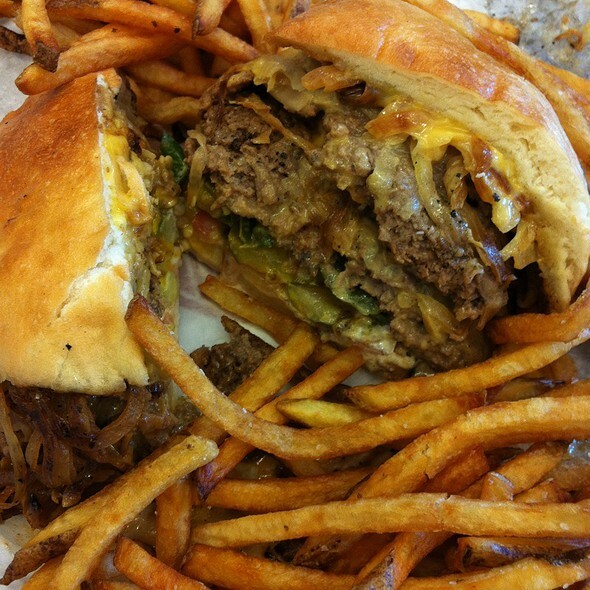 If you liked Tucker’s Onion Burgers, then you’ll probably also enjoy eating a burger from Nic’s Grill near 10th St. and Pennsylvania Avenue and the Penn Ave Church of the Nazarene. If you don’t want to wait in a long line, go at 11:00 am or 11:15 am. It is a burger you will never forget. Just remember to bring some cash because they don’t accept debit or credit cards.